One of the worst-kept secrets with Bond 25 has been the location shoot planned for Norway, which should start tomorrow. 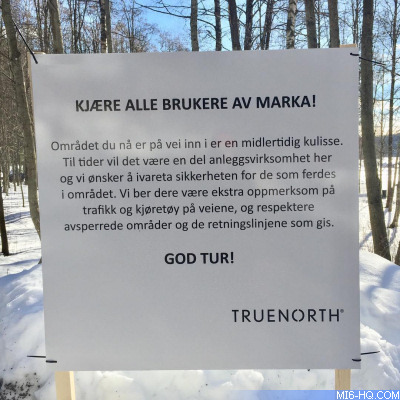 Today, the local production company True North started to erect signs for locals who will be prevented access. Previously, security had lied to locals that the area was being restricted for water samples. "Dear users of the marka! The area you are now entering is a temporary backdrop. At times, there will be one of the construction activities here and we want to safeguard the safety of those who travel in the area. We ask you to pay extra attention to traffic and vehicles on the roads, and to respect the restricted areas of the guidelines provided. Good trip!" Thanks to @station_z for the intel.